Mike Hiss, the 1972 Indianapolis 500 Rookie of the Year, passed away Dec. 19 in Evansville, Indiana, following a near-30-year battle with cancer-related issues. The 6-foot, 2-inch Hiss drove in the “500” four times, his highest finish being the seventh he scored in his rookie year in 1972. Born in Norwalk, Connecticut, and schooled in Sarasota, Florida, Hiss was bitten by the racing bug as a boy when his father took him to witness the 12 Hours of Sebring endurance race. He attended college in Deland, Florida, and began his racing career shortly thereafter, driving a Triumph TR3 in Sports Car Club of America competition at Marlboro, Maryland. During the next half-a-dozen seasons, he competed in Formula A and B, plus Formula 5000 before moving into United States Auto Club National Championship racing in 1972. Donohue had recently retired as a driver (this would last about six months), and Team Penske was about to announce Donohue’s successor as Peter Revson after four seasons with Team McLaren. By this time, Penske was in the developing stages of entering the Formula One arena and since this would not come until near the end of the season, Revson was cleared to drive in F1 in the meantime for the Don Nichols UOP Shadow team. 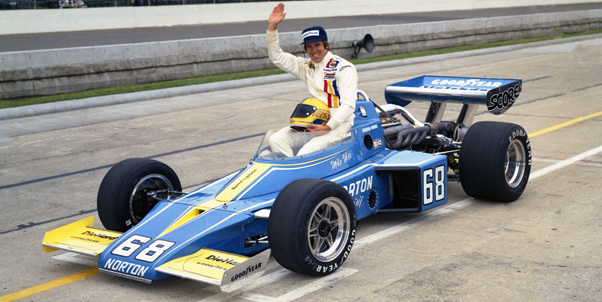 Hiss qualified for the outside of the front row of the 1974 Indianapolis 500, next to A.J. Foyt and Wally Dallenbach, and he later reminisced about his surreal experiences on race morning. Staying at the old Speedway Motel, he and his wife, Arlene, joined the line to the dining room for breakfast and was soon invited by a thoughtful staff member to nip into the kitchen for some privacy. After they had finished eating in there, they then proceeded to walk through the tunnel and across the infield to the Garage Area, Mike marveling that while completely unrecognized by the masses for the time being, he would shortly be starting from the front row as one of the 33 drivers the fans had come to see. Hiss’ 1974 “500” for Penske was not quite as spectacular as the 1972 Ontario race, but he was still around at the finish. He ran fifth at the time of his first pit stop but later lost quite a bit of time when the magneto failed, necessitating a “tow-in.” The magneto was changed, and Hiss was flagged off in 14th place at the finish, many laps in arrears. Hiss had two other starts for Penske that summer, both at the Michigan International Speedway where he finished seventh in the July 200-miler and fourth in the 250-mile race in September. His fourth and final “500” took place in 1975 when he was eliminated by a single-car accident after only 39 laps, and in 1976, he was unable to qualify at all with a Lindsey Hopkins entry. But there was to be one more chapter to his Indianapolis career. Mario Andretti finished third in the 1977 Formula One World Championship for Team Lotus and was already on his way to ultimately winning the 1978 title. In those days of much more freedom for the drivers in their careers, Andretti was competing in USAC Championship events for Penske whenever there was no scheduling conflict with F1. The plan was to compete in the Monaco Grand Prix on May 7, qualify for the “500” the following weekend and then head to Spa-Franchorchamps for the May 21 Belgian Grand Prix before returning to Indianapolis. Unfortunately, the weather at Indianapolis did not cooperate in the slightest. Saturday was a total washout, and so was Sunday. Faced with the excruciating possibility of jetting back and forth across the Atlantic multiple times with little or no rest, United States Auto Club officials agreed to having another driver qualify in Andretti’s absence with understanding that Mario would start the race in the 33rd and final position. The “other driver,” taking the call from Roger Penske, was Hiss, who had decided to remain in sunny California. He did, and in as much as he never raced again, it turns out that his final laps in a race car were the four qualifying laps he did for Andretti. That accomplished, he assumed he would head back to California. The Indianapolis Motor Speedway Radio Network was looking for a driver expert since veteran Freddie Agabashian would not be returning, and Hiss accepted the last-minute invitation. Just over two years earlier, in March 1976, Hiss had been a key factor in a moment of history. A driver was testing at the Phoenix International Raceway in an Eagle/Offy in which the partners included driver Lloyd Ruby and chief mechanic Mike Devin. Hiss was serving in the role of “coach,” and the driver was none other than his soon-to-be ex-wife, Arlene. Arlene began turning some very respectable laps speeds. She qualified for the 150-mile 1976 season-opener at Phoenix in the 24th and final starting position and was still around at the finish in 14th place. It was Arlene’s only start in a Championship car, but she did set a record which can never be broken. She was the very first female ever to start in a Championship race. After retirement, Hiss worked for Penske for a while in association with Detroit Diesel Allison and was headquartered in Houston. An ATP-rated pilot, Hiss flew both Cessna Citation and Lear jet aircraft. He visited IMS from time to time with his family and attended three of the United States Grand Prix F1 events on the road course as well as a Brickyard 400 and the occasional Indianapolis 500. In 2011, he was one of a large number of drivers on hand to celebrate the 100th Running of the first “500” and, in addition to signing a large number of autographs, he was one of the 161 drivers who appeared in the huge panoramic photo taken the morning before the race in Pagoda Plaza area. There he was able to meet Tony Kanaan, who had become his hero. Hiss is survived by Connie, his wife of 42 years, son, Brian and his wife, Getter; daughter, Jennie and her husband, Mike Freisem, plus two grandsons, Landon Anderson and Levi Freisem. Anyone wishing to make a donation in Hiss’ memory may do so at Crossroads Christian Church, 10800 Lincoln Ave., Newburgh, IN 47630.